It doesn’t take much thought to summarize current views on Asia: ‘Not interesting: US-China trade war; rising US interest rates.’ And the overall trajectory of Asia’s economic data doesn’t offer much challenge: Asia's overall shocks & surprises index has been mildly negative (with a short-lived reprieve in early June) since the end of January, and remains so today. However, the focus of weakness has changed sharply throughout the year. One of the advantages of tracking a large number of datapoints is that I can break this down these regional indexes into more specific countries or sub-regions. And that breakdown shows that there are quite distinct and divergent patterns of activity now emerging. Specifically, let’s look at the differences emerging between Greater China (China, Taiwan, HK), Japan, and the Rest of Asia. Since mid-July, Japan's data has tended to break consensus or trend positively, and the Japan index is now persuasively strong. More significantly, over the last year, its trajectory has begun to move in concert with trends in the US, suggesting that the economic ties between these two are beginning once again to tighten, having decoupled around the middle of 2016. On this basis, Japan looks the principal Asian beneficiary of the vigour of the US’s business cycle. 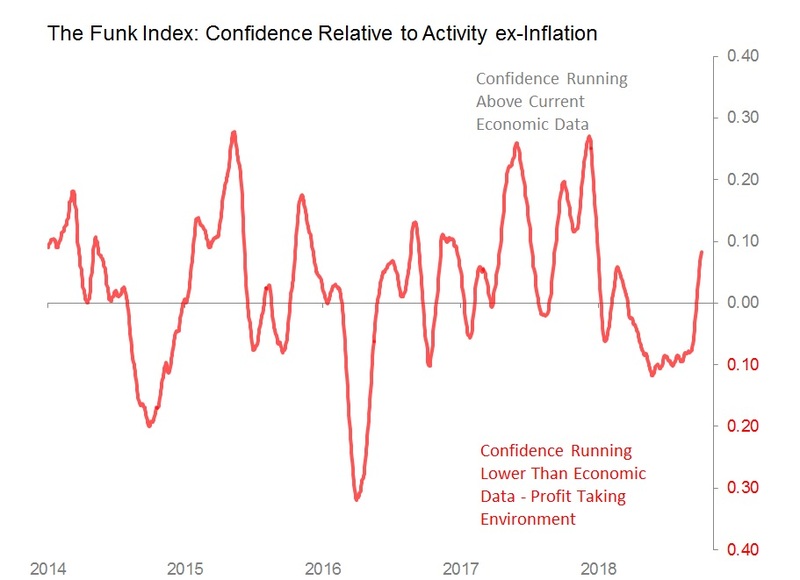 By contrast, Greater China has sustained a period of disappointing results since the beginning of August, in a way which reverses the surprises achieved earlier in the year. It is not difficult to believe that this sustained disappointment is connected with the evolution of US-Chinese trade disputes. Maybe the most interest result, however, is coming from the 'Rest of Asia, which since early September has strung together a series of surprises for the first time since the middle of January. As with Japan, it looks as if the Rest of Asia is beginning to feel the updraft from the US expansion. This is a genuinely surprising development. It has happened despite the scepticism which has enveloped emerging markets globally in response an earlier strengthening of the dollar and an assumption of repeated US interest rate rises. And it has happened despite the mounting weakness of economic data in some major Asian economies (principally S Korea). But the recovery of the last few weeks has also coincided with the stabilization/weakening of the dollar, and the upturn in the Funk Index. If it persists, the unexpected vitality of the 'rest of Asia' suggests that the positive impact on Asia of the US cyclical upswing is, at least for the time being, offsetting the negative impact of dollar strength and rising interest rates. It is an economic story which is being lost as commentators concentrate on US-China trade frictions and rising interest rates. If it continues, those stories will have to change.